Planning to go big or go home on the big day? Here's exactly what you'll need for a glam wedding that's flawless and fabulous. A glam wedding theme is the perfect decorative aesthetic for couples who are looking to embrace a little bit — or a lot — of wow factor on the big day. This dramatic wedding style will speak to those with a "more is more" mindset, since opulent details are key to nailing the right vibe. Metallic color palettes, fancy dress codes, and celeb-worthy decor ideas are just some of the elements that make up a glamour wedding theme, but we're sharing even more ideas in this guide to all things luxe. So whether you're a self-proclaimed diva (you gotta do you!) 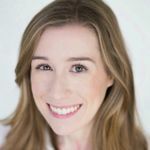 and want to convey that on the big day, or you simply want to make the most of your time in the spotlight, consider this your glam wedding cheat sheet. Start planning your glam wedding with these tips and ideas. 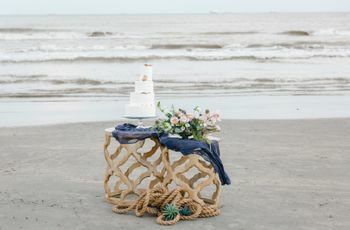 Glam wedding style isn't tied to just one season — it's adaptable for any time of the year depending on the color palette, decor, and attire that you choose. If you're thinking about incorporating seasonal elements (for example, holiday-inspired decor in the winter), do it in a subtle way so that your wedding still feels sophisticated and high-end rather than overly thematic. The first step when hosting a glam wedding is choosing a venue that's relatively formal — this will instantly elevate the vibe of your event. 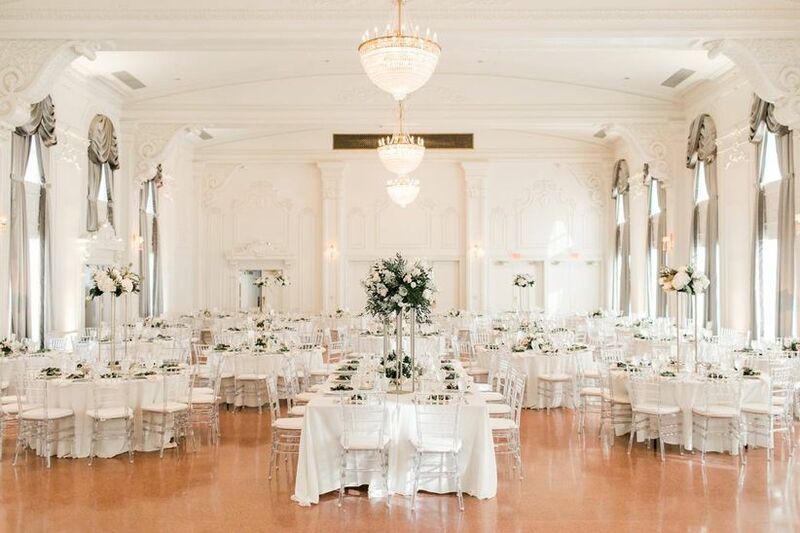 Country clubs and ballrooms are a great starting point, since they're usually adorned with glitzy decor like chandeliers, marble flooring, and gorgeous window drapery. Look for historic venues (estates, mansions) to give your wedding an even stronger sense of grandeur. If you're feeling especially glam, have a castle wedding. And no, you won't have to travel to a faraway European destination to find the perfect location! 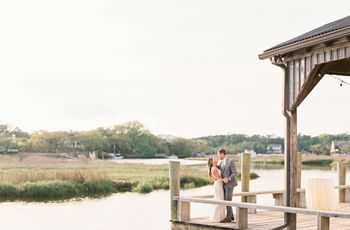 There are castle wedding venues all over the country that make gorgeous backdrops for a swanky affair. Glam wedding style is all about luxury, so your wedding color palette should be refined and elegant — but don't forget to include a hint of drama! We suggest starting with one or two neutral colors, like gold, white, black, gray, etc., and then adding a bold accent color to tie everything together. 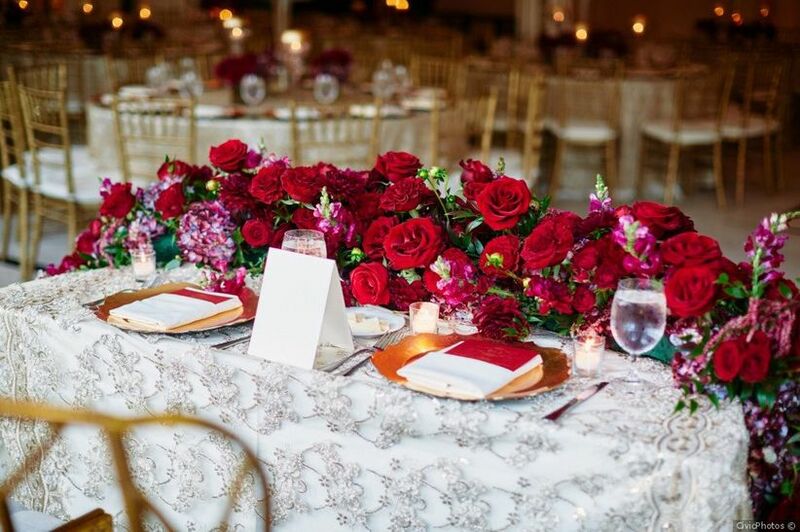 Red, emerald green, and amethyst are just a few of the glam wedding accent colors we're into right now. 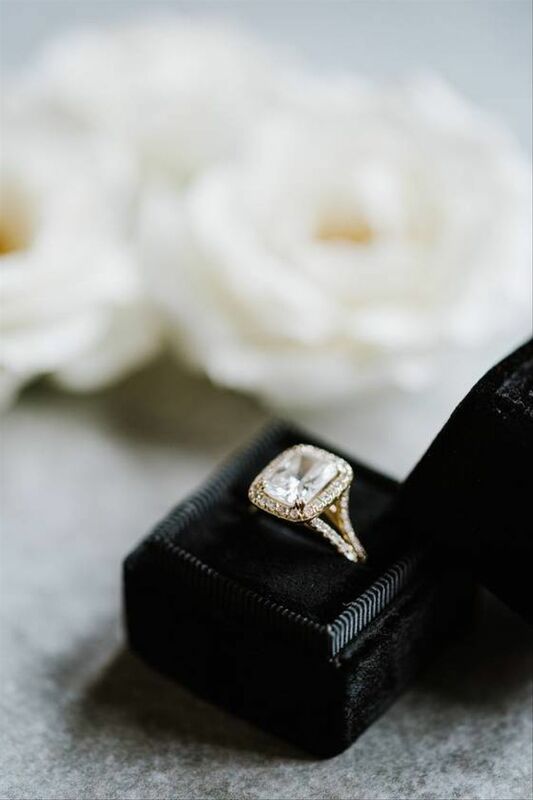 You can’t have a glam wedding without a little bit of sparkle, so don’t forget to factor that in when you’re choosing your wedding colors. Silver and gold work great as accent hues for most color combinations, but a completely metallic wedding color palette is another option we love. Alternative metal hues, like copper and rose gold, bring a modern spin to a glamour wedding theme. 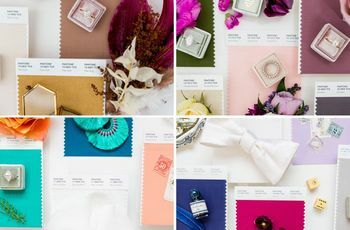 Some of our favorite glam wedding color palettes include: red, black and silver; ivory, pink and champagne; emerald, black and gold; and navy blue, silver and white. Another favorite of ours? 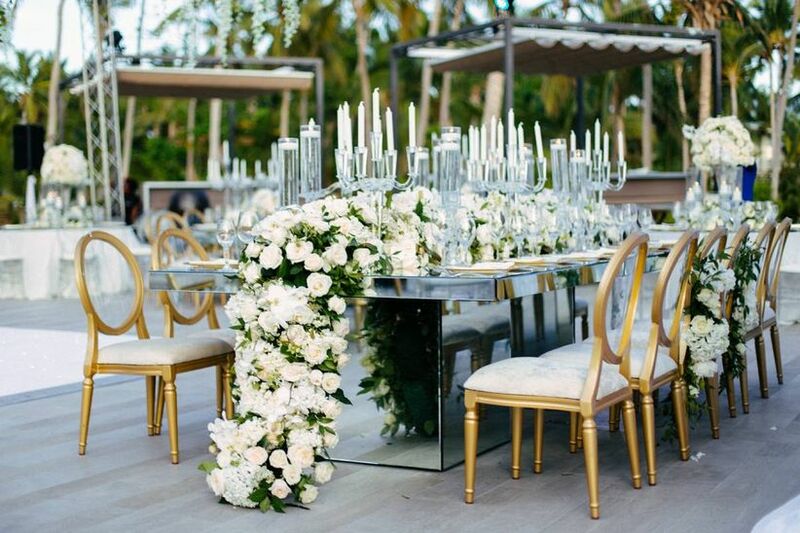 All-white wedding decor à la the queen of glam, Kim Kardashian. 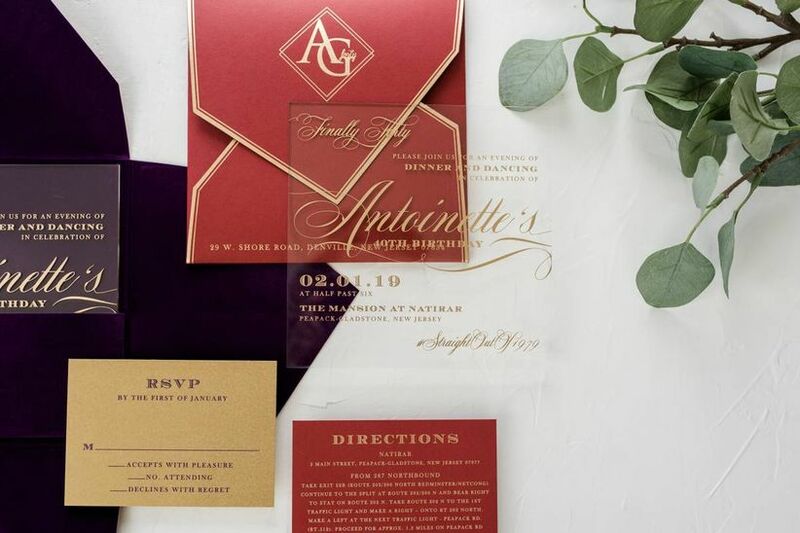 Your glam wedding invitations should be all about fancy accents. By adding decorative extras like crystals, laser-cut filigrees, letterpress script, and custom calligraphy, your guests will know that the wedding is going to be a glam affair to remember. For a fashion-forward approach, consider sending out acrylic wedding invitations like the suite pictured above. The key to glam wedding decor is choosing extravagant, opulent pieces. From sparkling table linens to multi-tiered chandeliers, you should look for luxe elements that stand out from everyday basics. No detail should go unnoticed, no matter how small it seems — this is essential when it comes to achieving a Hollywood-inspired vibe. An instant way to transform your space into a glamorous setting is by using fabric swags on the ceiling and walls. This creates a dramatic effect, especially when it’s combined with string lights or other accents that draw the eye upwards, like hanging floral arrangements or chandeliers. Some venues might have the swags in place already (or can easily add them), but if not, a rental company should be able to do it for you. You can also play around with unique lighting options to easily change the look of your venue. Uplighting, pinspotting, and gobos add a modern spin, while dozens of candles in varying heights creates a romantic ambience. Glam weddings are also a fun opportunity to incorporate decor that might be too avant-garde for other styles. 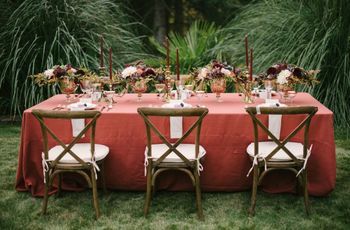 Ghost chairs are a modern alternative to the more traditional Chiavari or folding chairs, and they’re available in a variety of colors. Velvet chairs or chaises are super-glamorous, especially for winter weddings. To avoid going overboard with your decor (yes, there is such a thing as too much), decide where you want to put the focus. For example, if you have tall, overflowing centerpieces on all of your banquet tables, then you should keep your place settings and other tabletop decor relatively simple. Lastly, stick to your color palette. Too many different colors will look busy and confusing to the eye if you have a lot of decor in one space. If you’re having a glam wedding, think of your flowers as an extension of the decor. Ask your florist to create arrangements that will not only stand out to your guests, but also in your wedding photos. Work with your florist to choose flowers that exude luxury, such as calla lilies, orchids, roses, peonies, and ranunculuses. If you’re carrying a bouquet, a cascading style adds an instant splash of drama to your look. You can also add sparkling brooches, pearl strands, rhinestones, greenery, or long ribbons to your bouquet to make it truly one of a kind. Tall centerpieces are popular for glam weddings because of their eye-catching effect. 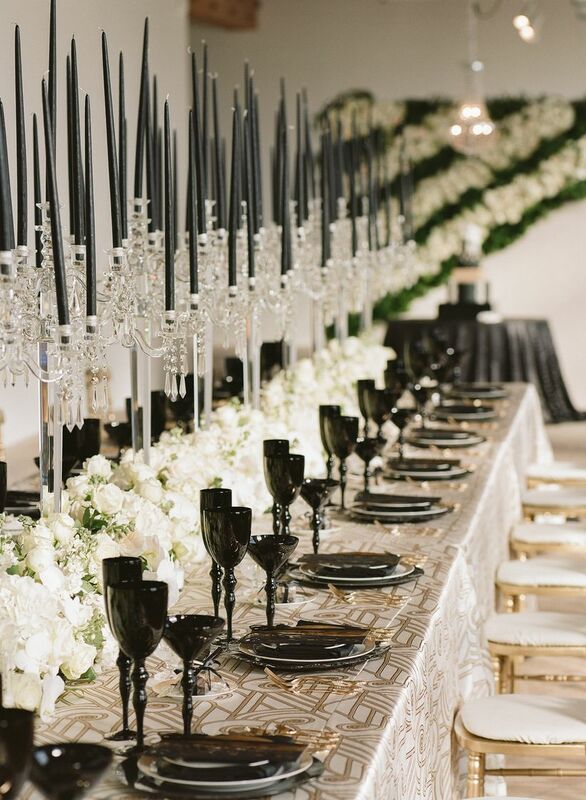 Display the blooms atop candelabras that are dressed up with crystal strands. If you prefer lower centerpieces, place them in clusters on each table for added impact. For the ultimate celeb status, have your florist create custom installations for you. You can exchange your vows in front of a floral-covered wall (Kim and Kanye had two of them) or dine beneath a lavish floral chandelier. The more outside the box, the better! Depending on the venue, most glam weddings will require a formal or semi-formal dress code. 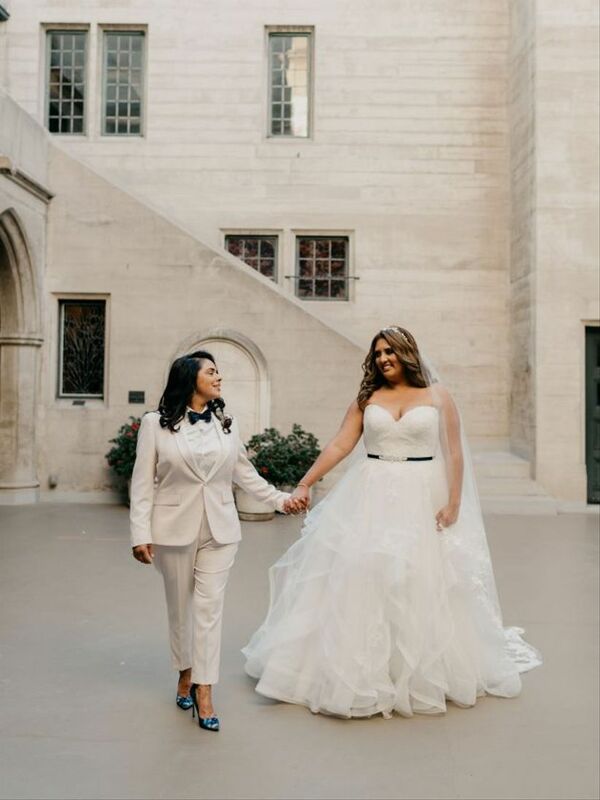 If you are wearing a wedding gown, accentuate your figure with a curve-hugging silhouette that’s fit for a red carpet, or walk down the aisle in a princess-style ball gown. Look for a dress with intricate details, such as beading, embroidery, and lace. Feeling trendy? Illusion bodices and colored gowns are a few glam options we love. 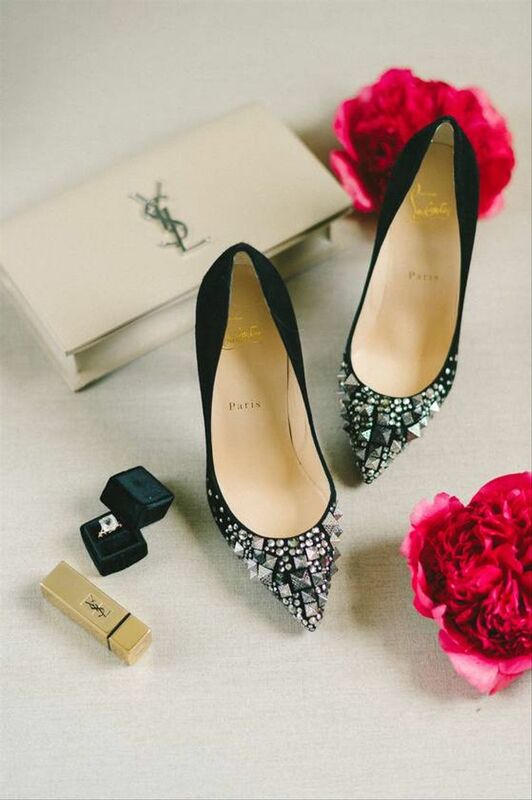 Glam weddings are also an opportunity to play up your accessories. Opt for glittery stilettos, statement jewelry or a beaded hair clip to add a touch of sparkle to your look. Suits and tuxedos should be darker in color. If you don’t want to stick with traditional black, you can opt for dark blue, which is still formal but a bit more modern and fashion-forward. When it comes to glam wedding cakes, bigger is better. 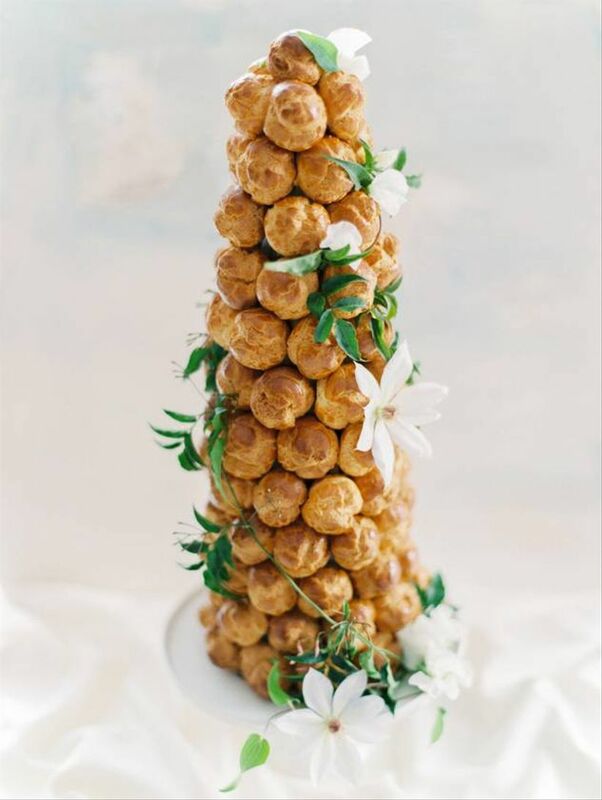 A multi-tier cake at a glamorous wedding isn’t just a cake, it’s a work of art. Ask your baker to dress up the tiers with metallic fondant, edible gold leaf, cascading flowers, or elaborate hand-piped icing designs. No glam wedding is complete without a bit of bubbly! Use coupe glasses to create a champagne tower as decor, and then end the night in style with a celebratory toast.